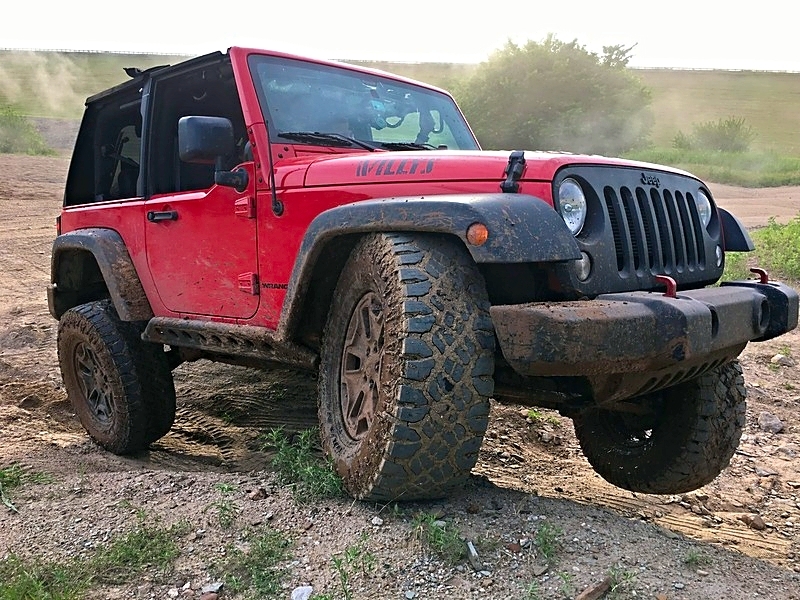 I bought some rubi springs, only because they were dirt cheap with the shocks (which was my initial purchase)... 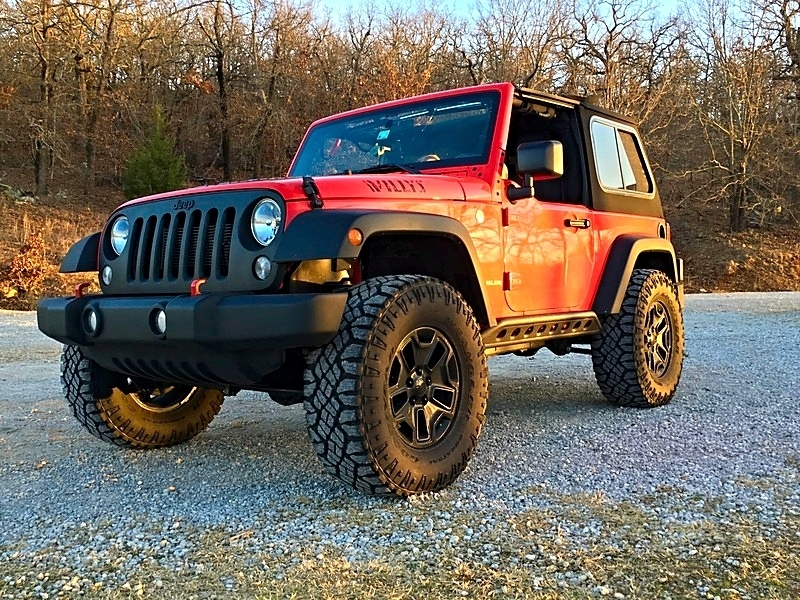 Painted them red and tossed them in my 2013 JK, manual transmission, only option is AC (and maybe gauge trim).... Anyhow it ended up lifting me a few inches. I installed geometry brackets because of this lift (fighting death wobble at the time) and the AEV brackets stated to measure from frame to spring perch and mine was 7" meaning I was instructed to use the middle hole which cooresponds to 3.5" lift. For reference my wifes stock 16 Sahara has 4" on this measurement. Fixed the death wobble with new Yeti TB and tie-rod. Replaced drag link with OEM quality parts. Solid as a rock now my Jeep feels. Drives great, solid AF it feels. Now my club on Saturday took us on some damn challenging trails, lots of rocks, lots of crawling around every corner at the end was like, **** me how in the hell? Great adventure! it was. However, now the wifes Jeep is in need of upgrades. I cannot afford to buy a lift and tires for hers (I can install myself). However, I can afford to buy my Jeep new tires/wheels and give her my fairly new 33's. Her tires right now measure 30" (regular stock like tire tread) with a tape and mine measure 32". They are KO2's... I assume they are right around 33". I can buy 35's (my end goal) for my 2013 Sport 6spd soft-top. With my springs (rubi take offs) I have 39.5" at fender height (from 37ish before the springs) I think I can stuff 35's on this and put my 32-33's on my wifes jeep. As I add armor/bumpers/winch etc I will probably end up needing to respring again but I'm not worried about that right now. I just want to shoe-horn these 35's in place. I want to cut my stock fenders anyhow, so I don't mind cutting/hacking anything up. I do nice work and love the opportunity to modify. Do you guys think they will fit? Should I avoid a wider tire? I'm from old school days of having my dual rear wheel diesel with 'pizza cutters' ... tall and skinny tires. Can I fit a full width 12.5 tire? where will I rub extra? Will my up-travel be my limit? I'll hack the fenders (nicely) if so. Going to pull the trigger soon so any advice is appreciated! I will attach a pic of my rig now with the 32-33's. So what do you guys think? Thank you all so very much for reading/replies. There she is on the 33's... Stubby bumper I can cut the fenders want to fit 35's. You probably don't want to hear my opinion but if she's going to be wheeling then I think the larger tires should go on the 4 door as opposed to the 2 door. They'll fit with a level kit and trimming the fenders (or adding aftermarket fenders). IMO it's in your best interest to make wheeling as fun and easy for her as possible. I know that's not what you want to hear, but 4 doors need the height more than 2 doors for the breakover angle. Nice! We are the opposite, she bought the 4dr so I traded in my Pilot and got the 2dr since I don't need storage I guess (these things are tiny!) Yes she wheels too, she wants to get an AEV 2.5 or Terraflex 2.5 which hopefully will come soon then her 35's probably tax return next year. She scraped a few times on Saturday but they were all on the skidplate passenger side - no diffs. I think 33's and replacing the shocks (rubi take offs like mine for now) will make a big difference. Her rears look warn although I never took them out. Her drop off bounce leaves some to be desired, however she learned to go slow helps! She does have the JKU and longer wheelbase needs more height I agree. Great thread you linked. Thank you for the read. I will as well need to recalibrate the computers for each Jeep. Which is the cheapest option here? 2 procals? I'm a fan of the interface on the Procal, you'll need one for each Jeep. 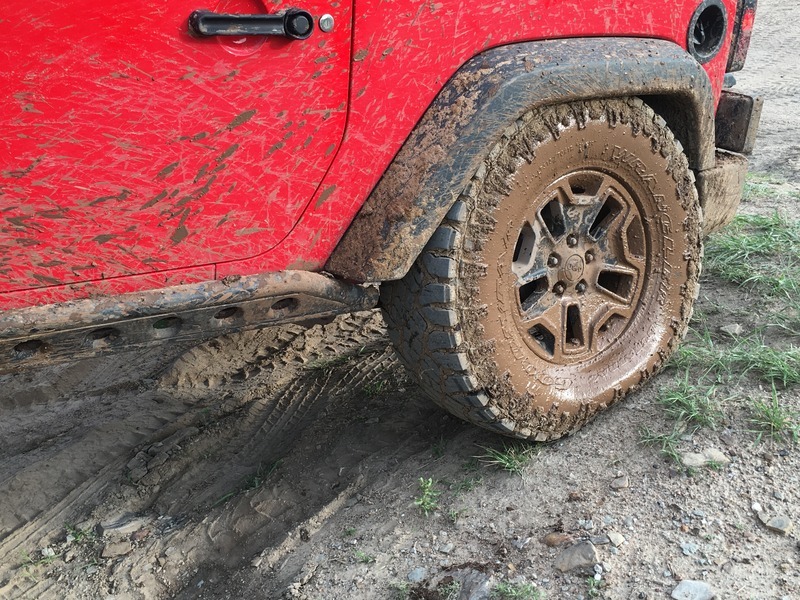 For reference my wife's last 2 door (since wrecked) used a 2.5" Teraflex lift (LINK) with a 315/70/17 tire and 1.75" wheel spacers on the factory wheel. This gave her 4.5" of backspace. That combo allowed her fit that tire fully stuffed when off road.